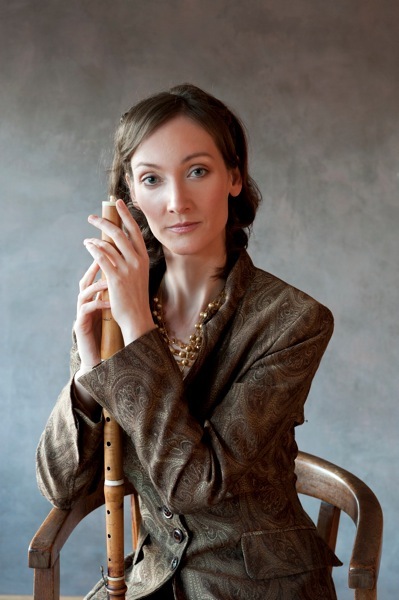 The transverse flute player Jana Semerádová is a graduate of the Prague Conservatory, the Faculty of Philosophy, Charles University (Theory and Practice of Early Music), and the Royal Conservatory in the Hague, the Netherlands (the class of Wilbert Hazelzet). She is a laureate of the Magdeburg and Munich international competitions. Jana Semerádová is the artistic director of the ensemble Collegium Marianum and programme director of the concert cycle Baroque Soirées and the international music festival Summer Festivities of Early Music in Prague. She is engaged in intensive research both at home and abroad and in the study of baroque gesture, declamation and dance. Many of her unique programmes are built on the interconnection of music and drama. Under her direction, Collegium Marianum stages several modern premieres each year. Jana Semerádová has made a number of recordings; her CDs with Collegium Marianum have appeared as part of the successful series “Music from Eighteenth-Century Prague” on the Supraphon label. On Supraphon she has also recorded her feature CD “Solo for the King”. She has featured extensively on the Czech Radio and TV, as well as on the radio abroad. Jana Semerádová has performed on prominent European concert platforms, like Bachfest Leipzig, Festival Oude Muziek Utrecht, Mitte Europa, Musikfestspiele Potsdam-Sanssouci, Centre de Musique Baroque de Versailles, Festival de Sablé, Innsbrucker Festwochen, Pražské jaro, Tage Alter Musik Regensburg, Vantaa Baroque, Konzerthaus Vienna, Konzerthaus Berlin, and the Palau de Música Barcelona. As a soloist she has collaborated with eminent artists such as Magdalena Kožená, Sergio Azzolini, Enrico Onofri, Philippe Herreweghe and Alfredo Bernardini and she regularly appears with the Akademie für Alte Musik Berlin, Wrocławska Orkiestra Barokowa, Batzdorfer Hofkapelle and Ars Antiqua Austria. Jana Semerádová teaches transverse flute (Prague’s Charles University) and leads interpretation workshops.